I haven't tried duct seal because it look to time consuming to pickout the used pellets. Collection 100% of my pellets is important to me for my basement 12m range and I really don't want to throw lead into the trash. A rubber mulch trap, to me, seems the easiest way to trap AND collect pellets. Here's a little photo essay of changing out a shot up cardboard box for a fresh one to demonstrate how easy and quick it is to collect your pellets. 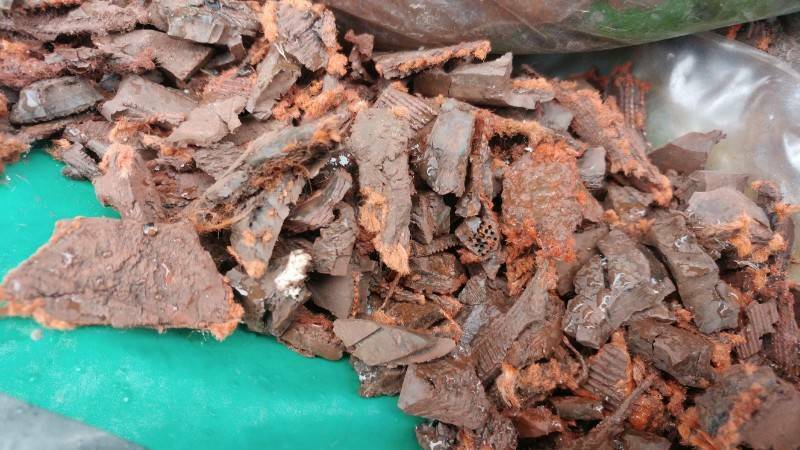 The rubber mulch is reused and the lead put back in the pellet tins. I tape fresh 8x11 targets on top of old ones until the box is to shot shot up. Since impact points are the same for all the targets I flip the box over every four paper targets to shift the rubber mulch inside. I dump the contents of the old trap into a large tray but you could just as easy dump it directly into your new box. Just give it a shake now and again and the pellets with move to the bottom. I push the rubber mulch into a pile. The lead falls to the bottom and I scoop up handfuls of the rubber mulch from the top of the pile and put it into the new cardboard box. My first trap was 10" deep and forty pounds of rubber mulch. HaHa, SO heavy and unnecessary. Now I use boxes that can fit an 8x10 peice of paper and are 4-6" deep. The box does not need to be deeper than that to stop a 700fps .22 pellet. I also nice that the trap is heavy enough that it does not move at all on impact. It's really important to pack the box tight with mulch. Add packing tape the the corners to reinforce the box so you can really pack it solid. Here's whats left in the tray. 2000 pellets. Yes, I've been having fun. And here's the fresh trap. I put a line of tape at the bottom to catch the paper bits and dust. Stick on a target sheet, shoot, repeat. I love how rubber mulch traps are so quick, low tech, quiet and 100% lead collection. Just one quick question, where to find the rubber mulch?? And is that comes in some size I need to note about? You can find rubber mulch at any garden or big box hardware store. About $10 for 20lbs bag. They typically come wet from being in the outdoor section of the store. I spread a new bag out on a tarp to dry it out before stuffing it in a box. Even though it is chopped up tires it's clean to work with. Does not make your hands dirty. I wonder how many shooters using duct seal just throw it in the trash? I use duct seal, but never put it into trash. And it looks the timing for collecting shot pellets should be the day I found the box just need to be replace due to the face I shoot on get 'wearing' put?! This is a good idea, always find it nice to find idea about collecting used pellet easier, how do you find the used pellet form? is it totally get squish when it hits the rubber? would you be able to post some close up picture of the used pellets. I like duct seal because you don't need much for it to stop a pellet. But it's annoying to clean the pellets out. I liked the concept of rubber mulch. The shock wave would mix it up. So shouldn't have any dead areas. But you need 3-4x more to stop a pellet, and stuck with a very heavy box. Plus the constant repairs to keep the mulch in, was annoying. I used a foam rubber mat. Kinda like self healing. But after a 100 pellets or so. The mulch would start falling out. I wonder if you make a wooden box. Put a hole in one of the corner, with a trap door. That you could shake it, pellets would collect in an area and open the door to pour out? Gotta be a mesh or material that be able to contain the mulch? But the mulch will not static stick. Since it's rubber. Normally old tires or shoes. Kinda rather have something that will hold the weight. Then a cardboard box that may not. And forced to reinforce it with tape. last thing you want is the contents spilling out when you lift trying to empty. The box I made at he time. Was just out of 1/2" pine panels. Couldn't imagine it being more then 2lbs w/o the mulch. And if weight an issue, then don't use mulch. Stick with duct seal. But a bag of rubber mulch is like 22lbs. And I used 3/4 of a bag in my trap. So it's going to be heavy anyways. Filled and put those foam over, couple strips of tape. But then I put 1x1 across to staple cardboard to place my targets on. From a broken bag, I checked a bit on the rubber pieces, and get the color transferred to my hand... And I don't want to do extra cleaning jobs on the floors, clothes, myself after handle this thing.